Definition of fiscal policy. 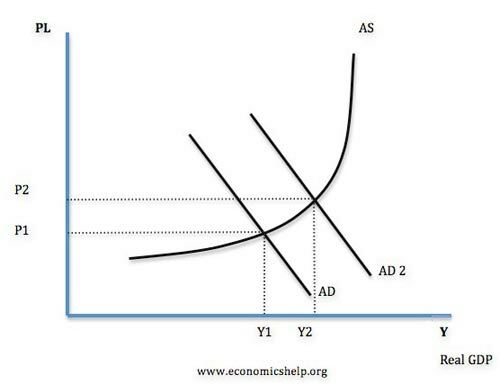 Fiscal policy involves the government changing the levels of taxation and government spending in order to influence Aggregate Demand (AD) and the level of economic activity. Fiscal policy aims to stabilise economic growth, avoiding a boom and bust economic cycle. Fiscal policy is often used in conjunction with monetary policy. In fact, governments often prefer monetary policy for stabilising the economy. 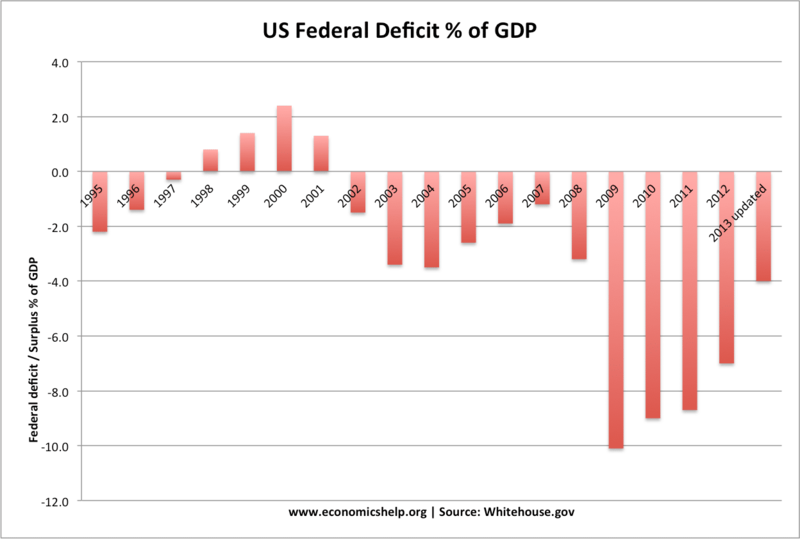 This will tend to worsen the government budget deficit, and the government will need to increase borrowing. Tight fiscal policy will tend to cause an improvement in the government budget deficit. 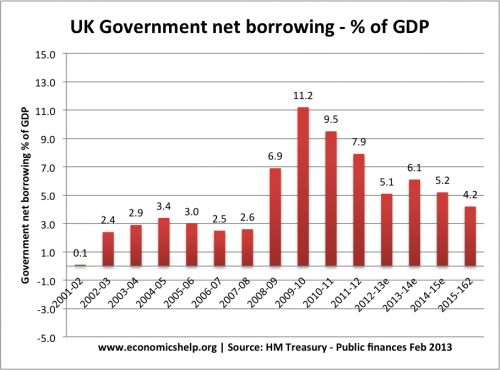 When the new coalition government came into power in May 2010, they argued the deficit was too high and then announced plans to reduce government borrowing. This involved spending limits. These austerity measures were a factor in causing lower economic growth in 2011 and 2012. Discretionary fiscal stabilisers – This is a deliberate attempt by the government to affect AD and stabilise the economy, e.g. in a boom the government will increase taxes to reduce inflation. The multiplier effect. When an increase in injections causes a bigger final increase in Real GDP. The government may have poor information about the state of the economy and struggle to have the best information about what the economy needs. Time lags. To increase government spending will take time. It could take several months for a government decision to filter through into the economy and actually affect AD. By then it may be too late. Crowding out. 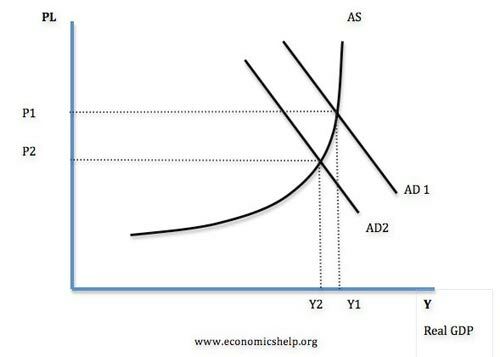 Some economists argue that expansionary fiscal policy (higher government spending) will not increase AD because the higher government spending will crowd out the private sector. This is because the government have to borrow from the private sector who will then have lower funds for private investment. Government spending is inefficient. Free market economists argue that higher government spending will tend to be wasted on inefficient spending projects. Also, it can then be difficult to reduce spending in the future because interest groups put political pressure on maintaining stimulus spending as permanent. Higher borrowing costs. Under certain conditions, expansionary fiscal policy can lead to higher bond yields, increasing the cost of debt repayments. It depends on the size of the multiplier. If the multiplier effect is large, then changes in government spending will have a bigger effect on overall demand. It depends on the state of the economy. Fiscal policy is most effective in a deep recession where monetary policy is insufficient to boost demand. In a deep recession (liquidity trap). Higher government spending will not cause crowding out because the private sector saving has increased substantially. See: Liquidity trap and fiscal policy – why fiscal policy is more important during a liquidity trap. It depends on other factors in the economy. For example, if the government pursue expansionary fiscal policy, but interest rates rise, and the global economy is in a recession, it may be insufficient to boost demand. Bond yields. If there is concern over the state of government finances, the government may not be able to borrow to finance fiscal policy. Countries in the Eurozone experienced this problem in the 2008-13 recession. Deflationary Fiscal Policy – impact on the economy of raising taxes and cutting spending. The difference between monetary and fiscal policy – Monetary policy has a similar aim to fiscal policy but involves changing interest rates and other monetary policies.